The Fall 2013 Korean exchange students at Grace College enjoyed their first breakfast of the school year at a local coffee shop. Students from a variety of cultural backgrounds, or who wish an intercultural experience, find a wide range of activities through Mosaic at Grace College and Seminary, Winona Lake, Ind. Mosaic supports students who are passionate about international and cultural initiatives by providing resources, opportunities, and publicity to specifically focused campus clubs. It is an umbrella organization that consists of 10 distinct on-campus clubs, each with specific cultural angles and activities. I Heart Muslims (IHM) exists to equip students to reach out to Muslims in the United States. Every year, they travel to nearby mosques to begin conversations with Muslims and to learn more about Islam. As they go through Bridges training and pray for Muslims, members of IHM become better equipped to share the Gospel with followers of Islam. Grace’s International Club provides an outlet for those who have backgrounds in other cultures, and also offers first-hand cultural experiences for those who don’t. From tango dancing lessons, to serving Zimbabwean dessert, to watching cultural movies, International Club provides a variety of activities to better acquaint students with other cultures. ​​Mu Kappa, another culture-rich group, is committed to helping missionary, military, and international students adjust to American culture. Hosting game nights, movie nights, ice cream nights, taco truck outings, bowling alley visits, and Starbucks sit-downs, Mu Kappa is the home-away-from-home for Grace College students from diverse backgrounds. The Grace College chapter of Destiny Rescue is a group committed to freeing those entrapped in prostitution. They seek to inform, pray, advocate, and raise funds to work towards ending slavery. The Grace chapter of the Black Student Association (BSA) celebrates African and African-American culture. BSA members add to campus life through worship, cultural, and informative events. Prayer for the Nations meets to intercede for missionaries, nations, and people groups around the world. Nurturing a passion for missions that compels students to join in God’s work in all cultures, it aims to not only open students’ eyes to international spiritual needs, but also to teach them about God’s heart. Another prayer group, Pray4NK, was established last year to pray for the persecuted Christians in North Korea, one of the most oppressive regimes in the world. 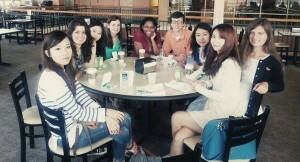 Grace College also boasts a French club, which meets to celebrate the rich culture and language of France. In addition, Grace hosts the International Welcome Committee, which aims to help develop a home-away-from-home for the cross-cultural members of the Grace campus, and a Latino club (La Fiesta), which exists to foster community and understanding regarding Latino cultures and to bring the life and joy of Latino culture to Winona Lake. Discover more information on the Mosaic website at http://gcmosaic.wix.com/mosaic. It's fantastic watching God at work in the lives of the students on Grace campus. So many students have a vision for the world, not just for themselves. Grace College is a campus of many cultures - which makes it a "world" within itself. But it's not a separatist world-view - it's becoming a blended world-view that gives our students a vision that reaches beyond the campus. We, who are members of the FGBC, should be grateful to God for what He is doing on the campus of the school that is part of the vision of the FGBC. I know I am.